It’s Memorial Day weekend and I hope that grilling is in your near future. 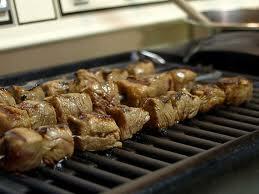 A great way to usher in the summer season is with the smell of beef on the bbq. This recipe is a bit laborious but pays off with taste and presentation. As well, it uses flank steak – an under rated piece of beef. The flank is from the belly of the cow and if prepared properly is tender and flavorful. One tenderization method is simply cutting across the grain. The other is pounding or butterflying which is a technique used in this recipe. So grab a beer, a margarita or chardonnay and enjoy the outdoors by grilling or partaking in other fun activities that will launch this carefree season. Preheat an outdoor grill over medium heat. 1/4-inch thickness, making sure to keep the rectangular shape as well as possible. Slice the pounded steak in half and each half in half again so you have four equal rectangles. Lay out the steak pieces so that the grain of the meat is going sideways. Evenly spread ½ Tbsp. of garlic paste and sprinkle 1 tsp of garlic salt over each piece of beef. Lay a piece of the roasted red pepper and two scallion pieces on each piece of meat. Starting from the bottom edge and rolling away from you, roll beef into a tight log; repeat with remaining pieces. Place two rolls back to back with the seams facing each other and do the same with the remaining two rolls. Skewer the rolls with six skewers spaced evenly apart so that each skewer goes through both rolls; repeat with the remaining rolls and skewers. Slice the rolls between the skewers into five pieces so that each skewer has two round rolls, like a stick with two lollipops. Sprinkle a little extra garlic salt on meat and place on grill and cook for 3 minutes each side.